The ViewSonic VP3268-4K was conceived to offer a stunning 4K resolution for enhanced clarity matched by the brand’s signature factory calibration with a DeltaE of less than 2. This product emphasizes the ability to display images with striking accuracy, so it includes special functions such as hardware calibration. Like its siblings in the VP line, the ViewSonic VP3268-4K once again aims to conquer a premium segment by offering functionality and performance while staying at a competitive price point. The ViewSonic VP3268-4K comes dressed for business with a minimalist design which has a matte black texture and sleek lines. All four sides of the face are bezel-free, save for panel and plastic borders which have a total thickness of no more than 4mm. Users get to enjoy 32 Inches of unobstructed viewing space while having a sleek but sophisticated looking display. 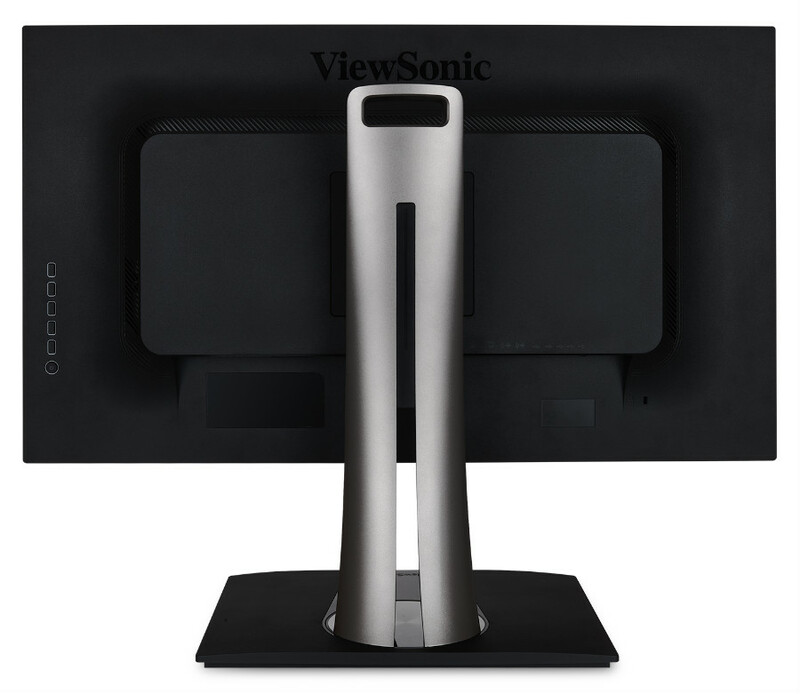 The rear of the slim cabinet includes all the functionalities of the ViewSonic VP3268-4K, with the OSD buttons on the right side being the most apparent. Frankly, using the latter instead of a more tactile solution like a joystick is a massive fault for a display of this grade. This model has been available for quite some time, but its still one of the more modern pieces out there with specs comparable to the Dell UP3219Q. The ViewSonic VP3268-4K sports excellent build quality even if the device is constructed dominantly out of plastic. The plastic panels used on the massive device feel thick and sturdy which goes well with its premium feel. We did not feel any flexing or creaking when adjusting the display, which followed gentle gestures smoothly. The only annoying characteristic aside from the OSD buttons is the ViewSonic VP3268-4K’s glossy accents which look appealing but difficult to maintain. Something as mundane as laying your finger will give the surface a smudge or mark, plus dust sticks to it like its magnetized. We recommend keeping a microfiber cloth handy in your desk drawers to ensure that you keep this display in tip-top shape. Under the bulge is where you will find the ViewSonic VP3268-4K ‘s I/O layout which includes numerous options. This product has a DisplayPort 1.2, a Mini DP 1.2, two HDMI 2.0 ports, and five USB 3.0 receptacles. There is also a pair of 5-watt speakers matched with 3.5mm jacks which are decent for background music, although you will look to a separate set for games and movies. The ViewSonic VP3268-4K has a slim cabinet, but its 10.45” depth is due to its stand which has a rectangular base and a curving upright. This display can adjust height up to 5.1 Inches, while you can also tilt, swivel, or pivot it to get a perfect view. However, if you want to attach this product to a wall or an articulated arm, you can do so since it is compatible with 100 x 100 VESA mounts. 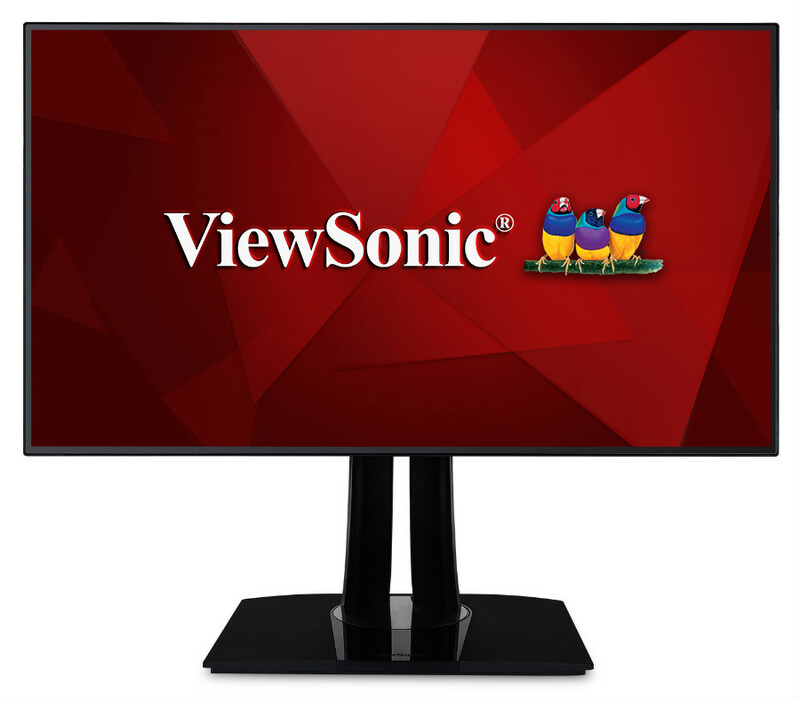 The ViewSonic VP3268-4K sports a 32-inch IPS screen with a 3840 x 2160 resolution, 60Hz refresh rate, and 17ms response time. An extended native contrast ratio of 1300:1 is also specified along with a maximum of 350 cd/m2 in brightness. This model supports HDR, but it can only accept the signal and translate it since it doesn’t have the necessary features. We love 4K monitors in this size since they offer an excellent balance between sharpness and intelligibility. You won’t need to apply scaling for small objects like text when using the ViewSonic VP3268-4K, but game graphics or movies will still look sharper than most displays. This model is a great candidate for a dual-purpose display if it had a bit of gaming pedigree. As mentioned, this module has an 8-bit interface with access to a 14-bit LUT, enabling wide gamut coverage of the sRGB, SMPTE-C, Rec. 709, and DICOM-SIM color spaces. There is no Adobe RGB option involved plus the screen is limited to 8-bit color and relies on dithering for 10-bit inputs. The bad news is you have to factor in the cost of a colorimeter if you want to push the ViewSonic VP3268-4K’s fantastic out of the box scores. The ViewSonic VP3268-4K posts excellent scores once scrutinized with a colorimeter like the DataColor SpyderElite V. The screen is able to put out 99% of the sRGB gamut with a DeltaE average of 1.5 which means the screen can produce lifelike images. Locking the screen in sRGB mode improves the DE to .5, but it locks brightness to a dim setting and reduces vibrancy to 96% sRGB coverage. Panel uniformity for the ViewSonic VP3268-4K is on a decent level, but keep in mind that this aspect varies from unit to unit. Variances in brightness did not stray beyond 10% and the screen looked equally illuminated at a glance. Each of the screen’s quandrants are within DeltaE 2.0 of each other, so deviances against the D65 standard and the display’s area are unnoticeable to the naked eye. One of the scariest aspects of the ViewSonic VP3268-4K is its pixel response time rating which plays between a minimum of 7ms and a max of 14ms. What’s fantastic is the numbers do not affect the motion handling as much as we thought it would thanks to an effective Overdrive solution in the OSD. We recommend leaving it at its normal level, but gaming will require its maximum setting to effectively reduce blurring. The ViewSonic VP3268-4K doesn’t have Adaptive Sync support, so users can’t enjoy tear and stutter-free PC gaming. However, we can say that the experience is still quite enjoyable due to the screen’s resolution, large size, and excellent quality. Input lag is slightly high at 20ms, but that doesn’t affect casual gaming at a noticeable or disturbing degree. The ViewSonic VP3268-4K presents excellent value especially now since its selling with a massive discount over its original launch price. The screen has excellent properties which we know meticulous users will want in a mixed use display. It’s a fantastic high-end 4K choice for day to day tasks or even casual gaming on PC or consoles. However, one thing that’s missing on the ViewSonic VP3268-4K is Adobe RGB support which is highly sought-after by the prosumer crowd. Some physical features could also use some improvements, but those are minor compared to the screen’s output. Overall, the ViewSonic VP3268-4K is a superb buy and a viable and more practical alternative to the Dell U3219Q. Would you know if display port is 1.4 or 1.2, at Viewsonics site they say 1.4 would they have upgraded that or something? Hi, Sam! ViewSonic’s specification list is more accurate, especially since manufacturers reserve the right to change these things without notice. The specs listed came from a preliminary announcement, so there always will be differences once a certain product is released. I feel horizontal stipes on ViewSonic VP3268-4K. it gets worse on left side of this monitor. I reported this issue to ViewSonic. They said that it is just a normal panel characteristic. If so, why did they use such panel for their flagship monitor? I still feel unpleasant with the stripes. if you are not that sensitive, stripes could be ignorable for you. But, is this for designers? Hello, Springwalk! We are sorry to hear about your experience on the ViewSonic VP3268-4K. Fortunately for us, we did not experience this issue on the review unit, so it could be a defect on yours. Did you try to ask for a replacement unit from your retailer?